The Law Offices of Michael A. Fiumara has represented customers and tenants throughout the North Bay who have suffered injuries from unsafe balconies and/or defective balcony structures. These balcony injuries occur with undesirable frequency on commercial properties, parking structures, stores, apartments, and even homes. Such injuries include falls as well as other injuries suffered in the partial or entire collapse of parts of balconies, decks and stairway structures. Whenever negligence or a defect are at issue, California law allows the injured party to file a legal claim against the owner and operator of the property as a premises liability case to recover money for medical expenses, wage loss, and pain and suffering. Our law firm, like you, wants to hold all parties liable who were responsible for contributing to your accident relating to balcony, deck, porch and stairway collapses and/or defective parts of all four. Individuals as well as businesses that allow cost concerns and short cuts to trump public safety bear legal responsibility to those who are injured on balconies on store fronts, parking structures, apartment houses, and even homes. In California, the owner of residential or commercial property has a duty to maintain the premises in a way that minimizes the risk of injury to visitors, and inhabitants alike. Oftentimes, the homeowner or business fails to properly safeguard and monitor the weight load on a deck or balcony which can result in devastating consequences. Further, a commercial or residential property owner could also fail to have the deck properly constructed or maintained and if the structure was improperly connected to the main building structure, liability attaches. If you or a loved one has suffered an injury or even worse, death, because of a deck, balcony, porch, stairway or other structural collapse, you want a skilled and experienced personal injury attorney to protect your interest and get to the bottom of what happened. The Law Offices of Michael A. Fiumara together with its very experienced and skilled team of dedicated attorneys and experts brings more than forty years of combined experience to the people of the North Bay including all of Marin and Sonoma Counties who have been injured in a deck or balcony collapse. Mr. Fiumara knows firsthand what a lack of city building inspectors could mean for innocent apartment dwellers. Mr. Fiumara earned his Master’s Degree in City Planning in 1982 from The University of Pennsylvania in Philadelphia. In his previous profession, Mr. Fiumara spent many years in government working for the mayors of New York City, Philadelphia and Newark, New Jersey. 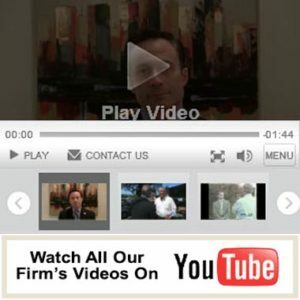 Since its founding in 1992, the Law Offices of Michael A. Fiumara has placed a very high priority on personal service and attention, working directly with his clients throughout the entire legal process from the first meeting with an attorney until your claim or case is successfully resolved or litigated. Our law firm has intentionally kept its practice small so that we have the flexibility to quickly respond to any developments in your case on a personal level. In addition, we can be accessible and available whenever you need to talk with us. On the other hand, because of our team approach and two conveniently located offices in the North Bay, we offer the resources and knowledge base you customarily find at much larger law firms in the area. Negligence in the construction of the deck. The architect or builder of the deck or balcony may have not only poorly designed the deck but could have used substandard materials. The deck or balcony may not have been built according to the “approved” plan and or the original design drawings to save money, time or both. Oftentimes, without frequent City or County inspections, builders and owners will cut corners to save time or money. The deck may not have been constructed with properly treated lumber or may have not been inspected for wood rot or infestation which could have weakened the structure causing it to fall or collapse. Failure to warn and failure to consider and monitor the structure for maximum weight loads. Often without much thought, home owners as well as business entities hold events on decks and balconies without regard to the maximum weight bearing capacity of the structure. Design and structural defects are sometimes considered the primary reason for deck and balcony failure. Failure to properly connect the deck to the main structure often weakens the weight bearing load. If the deck, porch or balcony is not properly integrated or connected to the main house or building, it can fall away and collapse especially with vibration or any earth movement due to earthquakes or other natural and man-made events. Water intrusion is one of the biggest culprits for contributing to a deck, stairway, porch and balcony collapse because water and moisture eventually weakens the structure when not properly weatherized, inspected or both. It is our job to seek full and fair compensation for all your losses which have occurred in a deck, stairway, porch or balcony collapse including recovery of all lost wages and income, reimbursement for medical expenses and pain and suffering. We will work tirelessly to pursue compensation for physical pain and suffering, as well as loss of consortium or companionship for everyone who has suffered as a result of these types of unfortunate events. As the claimant, you have to build your case to prove damages and losses that you suffered in the accident. An experienced personal injury lawyer will have access to the necessary experts and resources required to build a strong case to ensure that you receive FULL compensation. At the Law Offices of Michael A. Fiumara, we have recovered millions of dollars for personal injury clients since 1992. We work quickly and diligently to thoroughly investigate the collapse collecting all evidence required to win your case. WE fully understand how this incident has created an enormous hardship for you and your family and hence we are committed to be by your side every step of the way. In Santa Rosa you may reach us at (707) 571-8600 and in San Rafael you may reach us at (415) 492-4507. We will take your case on a contingency basis, only charging legal fees if we recover compensation for your losses.